These trips can be bespoke or shared, depending on other pets’ arrivals and departures. 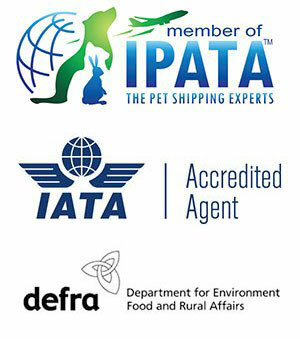 We can of course deliver pets to other UK destinations. Trips in the opposite direction are also available. Although pets can be transported as excess baggage or even in the cabin on some flights, they aren’t allowed to enter the UK in this way. They must arrive as ‘manifest cargo’ which is a more expensive way to fly and incurs additional landing charges, too. It may also mean your pet can’t travel on the same flight as you. If you land at a Paris, Brussels or Amsterdam airport instead of a London airport, we can collect your pets and bring them into the UK by road, travelling via Eurotunnel. You may be able to travel with us too. If you have to change planes at one of these airports for the last leg of your journey to the UK, you may find that the UK-bound plane is too small to accommodate a very large dog or a large family of pets. Animalcouriers can collect your pets at the airport and bring them into the UK by road, travelling via Eurotunnel. You may be able to travel with us too. Private planes aren’t allowed to land at London Gatwick or Heathrow; and pets aren’t allowed to enter the UK via any of the smaller local airports in the south-east. Animalcouriers can meet your private plane at an airport on the northern French coast, such as Calais airfield, and bring your pets into the UK via Eurotunnel. The situation will be similar if you’re travelling by boat to the UK other than on a ferry route that’s approved for pet travel. We can meet you at a port on the northern French coast and bring your pets into the UK via Eurotunnel.